Instead of getting the Hollywood spin about your favourite celebrities, why not go straight to the source? In Celebrity Pets Tell All, if the walls could speak, you wouldn't get any better information than you'll find here. It's an intimate look at the truth behind the illusion. Where the fur meets the road. You'll hear from Shirley MacLaine's dog, Audrey Hepburn's dog, Mr. Famous, Nicole Richie's and Paris Hilton's small dogs, George Clooney's potbelly pig, Max, Hillary Duff's dog and many more. Lai converses with the animals in a relaxed, humorous style. Through the animals' strong, distinct personalities, you get a dose of celebrities' quirks, habits, likes, and dislikes. The scandal sheets and gossip magazines fabricate stories about who is sleeping with whom and who is getting divorced, or pregnant, or suffering from some exotic disease. 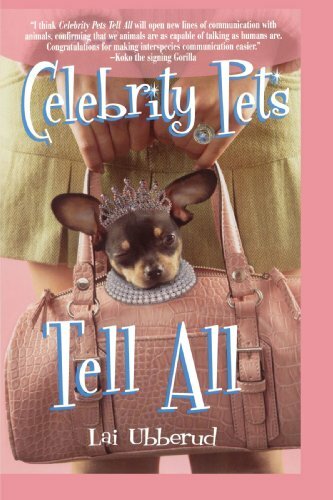 Celebrity Pets Tell Alltakes us on an intimate and refreshingly respectful journey into the private lives of the people we have come to know through the silver screen and small screen.